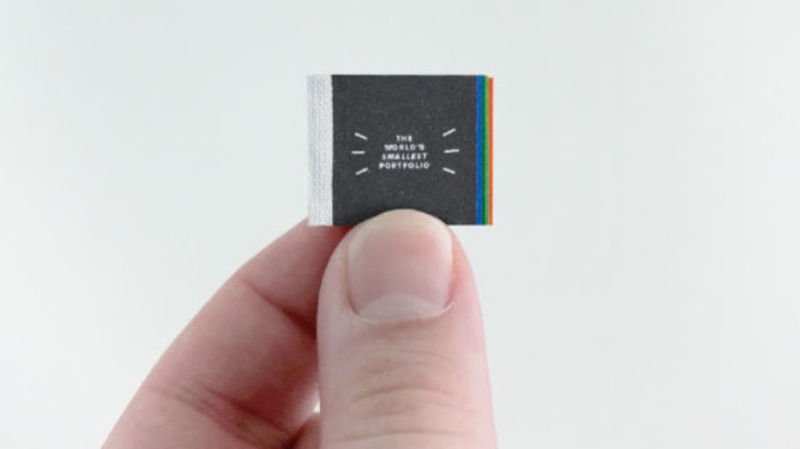 The portfolio is about the size of an average postage stamp—just 24 millimeters wide by 19 millimeters tall—and features old, new, and in-progress pieces. But rather than shrinking down his work to fit the tiny dimensions, he distilled each piece into a single image and corresponding sentence to demonstrate his skills as "an ideas-driven visual communicator." Lester's portfolio—which won jelly London's Making Your Mark brief submission contest—can be seen in part on his Behance page. In an interview for jelly London's blog, Lester explained his inspiration, saying that he wanted to see how small he could get his portfolio while still demonstrating his style and without losing each piece's primary message. This wasn't Lester's only 2015 D&AD success. Lester won a Graphite Pencil for D&AD’s New Blood Awards in recognition for his submission to the Envision Yourself in 10 Years Time brief from WeTransfer. His project, "Hire (The Future) Me," “invited people to hire me for free, but for 10 years’ time and for skills that I’ve yet developed,” Lester writes. So he built an interactive website where clients can book him for the future, and then “receive a hand signed I.O.U ticket” to hold him accountable. In the technology world, so much can happen in 10 years. In 2005, YouTube was launched, Microsoft introduced the Xbox360, and people still used the iPod shuffle. So what will happen to graphic design by 2025? “I think right now we are seeing a range of ways to make work. At one end there’s the cutting edge technology driving forward,” Lester explains. “But there’s a drive for tactile things too. I think in 10 years' time, we will know how to bring these two ends of the spectrum together more naturally." But even as technology changes, good graphic design—and especially advertising—will still require effective storytelling. And Lester’s prepared to give the future all he’s got.